Permafrost is frozen ground that forms where the subsurface mean annual temperature is colder than the freezing point of water. It should come as no surprise that permafrost underlies most of the Arctic and Antarctic regions on Earth. However, even close to the Equator, if you climb high enough in elevation, it will get cold enough for permafrost to form. The peaks of several mountains in tropical regions around the globe have permafrost, and one of them is in my backyard atop Mauna Kea, Hawaii. I went there last week to help conduct a geophysical field survey to study Hawaii's frozen feature and gain some insights about low latitude permafrost on Mars. University of Hawaii meteorologist Dr. Alfred Woodcock first discovered permafrost on the north-facing slope of the Mauna Kea summit crater Pu'u Wekiu in 1969 (elevation 4,200 meters) and returned several times to study it throughout the early 1970's. He found that even though the mean annual air temperature was well above freezing, ground temperatures were low enough in the shadows of the crater wall slopes for ice to persist, likely due to local trapping of nocturnal cold air lakes. 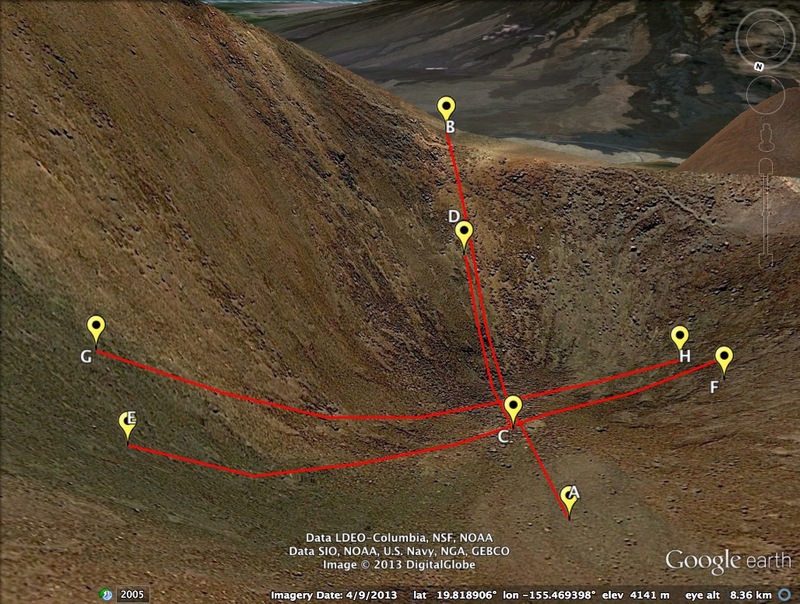 Through in situ borehole measurements and a small seismic refraction survey, he was able to determine that the permafrost extended down about 10 meters beneath the tropical island volcano's tallest cinder cone crater. 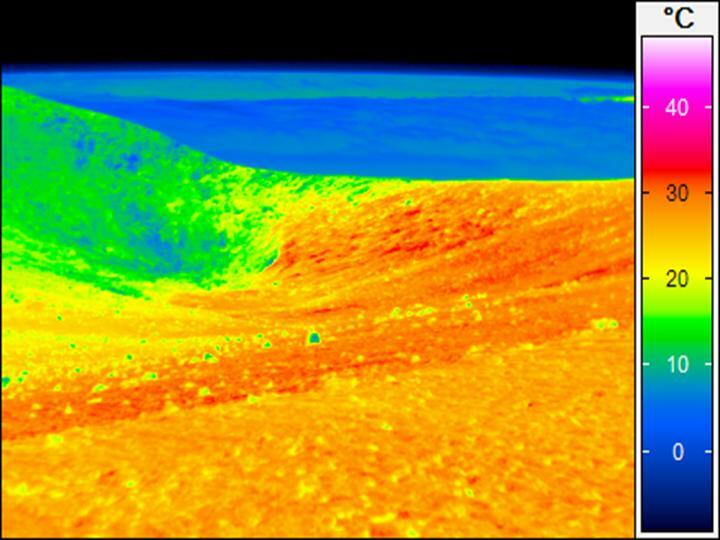 This finding was largely forgotten by the scientific community for 40 years until University of Hawaii astrophysicist Dr. Norbert Schörghofer started investigating the persistence of Hawaii permafrost as an analog to subsurface ice on Mars in 2009. 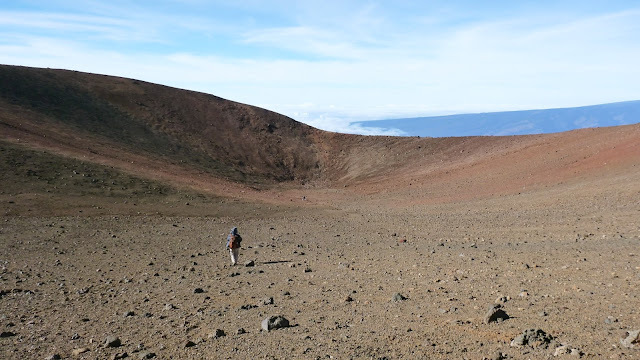 With support from the NASA Astrobiology Institute and the State of Hawaii's Office of Mauna Kea Management (OMKM), he conducted a series of small pilot studies to deploy infrared cameras and image the diurnal temperature variations in several of the summit craters. 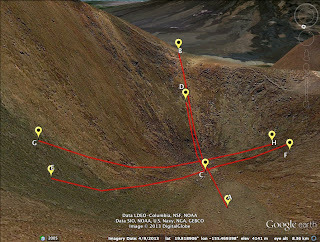 Sure enough, the north-facing crater walls were colder than the surroundings and could harbor ice. Norbert teamed up with one of the world's foremost experts on permafrost Dr. Kenji Yoshikawa (aka: Tunnel Man) from the University of Alaska Fairbanks, where I was once an intern 15 years ago. Together, Norbert and Kenji deployed dataloggers to measure long-term air and regolith temperatures in several craters near the Mauna Kea summit. Their readings corroborated Woodcock's measurements of lapse rate (the way temperature decreases with depth), indicating that permafrost shouldn't exist on Mauna Kea below about 5,000 meters elevation at all. The fact that Woodcock discovered it at 4,200 meters points to the significance of a microclimate effect to enable permafrost to exist even in places where it normally wouldn't. Maybe such microclimate effects could also allow for stable water ice to exist in shadowed craters on Mars permafrost on Mars as well. 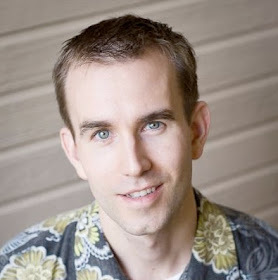 In January 2013, I entered the picture as a Ph.D. student looking for a project that combined planetary science with geophysical observations and field work. This opportunity fit my interests and background perfectly since it combines studying important environmental and astrobiological conditions on both Earth and Mars. I started working with Norbert to enhance the processing of his infrared imaging data and am happy to have now had the chance to apply my expertise in exploration geophysics to the project with our recent resistivity survey. For the uninitiated, resistivity is a property of earth materials that characterizes how resistant it is to electrical current flow. It can easily be derived from Ohm's Law, and for a full description of the theory and application of resistivity, I refer you here. Previously, I have been involved with resistivity surveys as a student and teaching assistant in an Exploration and Environmental Geophysics course, so I was very excited to apply that past experience to the problem of characterizing permafrost in Mauna Kea's Pu'u Wekiu crater during a three days of field work last week. 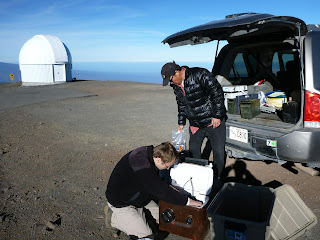 Norbert, Kenji, and I arrived on the Island of Hawaii and headed over to the Institute for Astronomy's Hilo facility to test the field equipment, review the survey plan, and meet with OMKM officials to ensure our activities would minimize environmental and cultural impacts on the mountain. We ended up spending a lot of time in the office downloading software and testing cabling to ensure we could retrieve data from the Syscal R1 Plus resistivity-measuring device. Once we were satisfied it all worked, we loaded the truck and headed up to the Hale Pōhaku facility, which was our home for the next two days and nights. This was my third time working from the astronomer dormitory site, after having been there in July 2012 with PISCES and April 2013 with HI-SEAS. 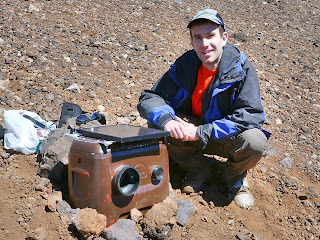 With an ambitious schedule to keep, we got up bright and early to eat breakfast at 6:00am and head to the summit, where we unloaded the equipment and hauled it by foot to the crater floor near the area where Woodcock had discovered permafrost. Norbert and I set up the infrared camera (which had been expertly built by postdoc Brendan Hermalyn), while Kenji looked for the dataloggers he had left in the crater previously. By about 8:30am, we were ready to begin the resistivity survey. This involved laying out a long cable with probes ever 5 meters and connecting them to the Syscal device. We opted to start with a north-south profile extending from the crater floor up to the rim along the line of borehole measurements Woodcock had taken in the 1970's. We were beginning to collect data by around 10:00am when we were joined by two undergraduate interns, who assisted for the rest of the day. They helped us lay out a second profile perpendicular the first across the crater wall and re-configure the first profile to have a 2.5-meter spacing for higher resolution measurements. It was an exhausting day working in the low-oxygen conditions of 4,200 meters elevation. We returned back to Hale Pōhaku about 6:00pm to eat dinner and review the data. The data indicated some artifacts likely produced by a few probes that weren't coupling well to the ground. To rule out a possible equipment problem, we opted to take measurements from both ends of resistivity profile lines to see if the bad data points showed up in both configurations. That meant another early day on the mountain. This time, we had eaten and gotten to the site by 7:30am. Kenji started taking more resistivity readings, while Norbert and I set up a third survey line perpendicular to our main one and higher on the crater wall. When the data didn't look very promising, I volunteered to hike back to the truck to retrieve the heavy 75 Amp-hour deep cycle battery in case it could supply more power to aid our survey. It ended up not making much of a difference, but at least I got a good workout carrying the 60-pound mass up and down the crater rim! In the end, we collected both Wenner and Schlumberger array data for three profile lines in the study area. Our goal is to determine whether permafrost still exists on the summit of Mauna Kea, as it can teach us about how this area's climate continues to change in the wake of the last ice age. It can also shed some light on the question whether permafrost could exist in low latitude regions on Mars too, raising tantalizing questions on habitability for life there. With today's warming climate and nearby Lake Waiau drying up, it would not come as a surprise to find that the permafrost on Mauna Kea has shrunk or even melted away compared with what Woodcock discovered more than a generation ago. So far, we have not detected definite signs of permafrost in our brief review of the resistivity data, but I am optimistic that we will be able to draw some useful conclusions upon further analysis. The project is funded for three years, so there will be other field excursions to report in the future.